Consistency across your content builds credibility and reinforces your branding, whether you are communicating on Facebook, Instagram, Twitter, or any other platform. Your “brand voice consists of both the tone of your communication and the specific words, terms, and expressions you use to present your organization. It represents your organization’s identity and personality—and, without it, you may not be able to build a strong following or engage your audience. "The social media voice of Whitman-Walker Health reflects messaging that serves our patients and clients. That is the "who/what" our voice is. One person handles most of our messaging, but we have a team of people who contribute. With that in mind, for us, maintaining consistency means projecting messages that resonate with the needs of our clients, accessibility of our services, and the judgment-free, respectful encounter we aim to offer our community." -- Jewel Addy, External Affairs Manager, Whitman-Walker Health, -Washington, DC. Define what your organization stands for—its values, story, and goals. It can be helpful to picture your organization as a person. How would you describe her or him? Passionate? Well-informed? Professional? Consider how you would express these qualities in writing. You may want to write in a tone that is relatable to an individual, rather than a group. You can practice doing this to help narrow your focus, maintain consistency in your voice, and make your message resonate. Your brand voice will be heard if you make your target audience feel they are engaging with a person. This means using common words, digestible sentences, and active voice. Listen to your audience. Interacting with your followers and paying attention to their tone and language will help inform how you can adapt your voice. Be consistent. 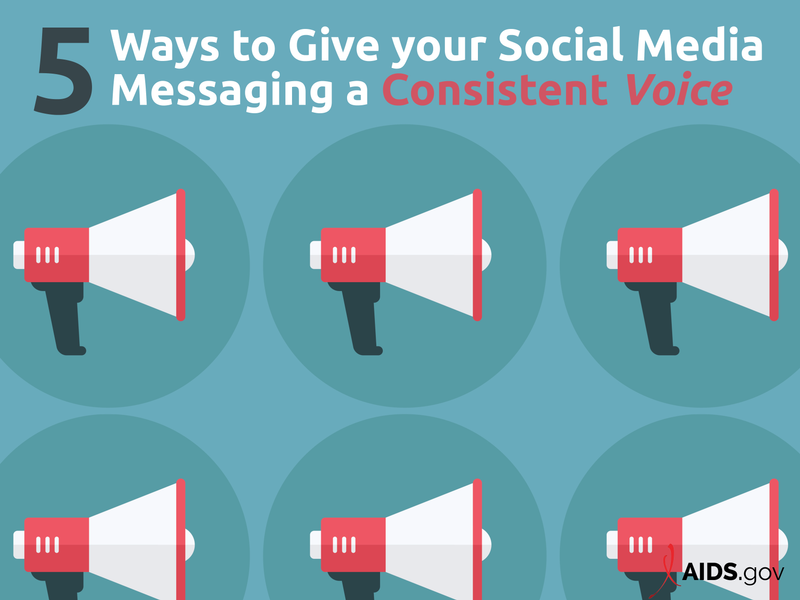 Each status update, image, video, reply to a message, or any other content you share on social media reinforces your brand voice. This is where many prospective followers will first see you and where many followers will engage with you most often, so make sure your brand voice is consistent throughout their experiences. Consider using each of these pieces of content to tell brief stories that highlight aspects of your organization. Create a style guide. Make style guides reference available to everyone who will share social media content for your organization to ensure consistency in the brand voice, terminology, grammar, and even the color, design, and font choices used in all social content. Check out this example from Hootsuite . Make sure everyone is on the same page. If you have more than one person creating and sharing social media content on behalf of your organization, make sure they are all using the style guide to create content. Getting buy-in and consistency from your team is the best way to use your organization’s brand voice. For more assistance on how you can create your social media voice, please sign up for HIV.gov’s Virtual Office Hours.